For a beginner that is starting to play foosball, the Kick Venture foosball table is a great choice. The features it has to offer for the price are extensive and great, and qualify it to be used by intermediate players as well. 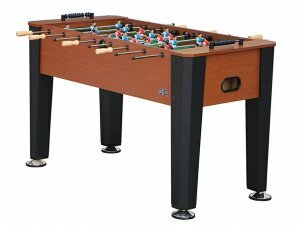 We rank 3 Kick tables in our list of the best foosball tables overall, and although the Venture didn’t make the cut, it is still a nice table at a really good price…plus Kick has the best warranty on the market. The Kick Venture foosball table is 55 inches in length, 28 inches in width, and 36 inches in height. It weighs around 110 lbs, which isn’t too heavy so it makes it portable if you need to move it out of the way at any point. It’s good enough for a beginner player to play with, so long as the game doesn’t get too intense. A wide range of players would find it suitable because it’s almost a full-size table, however, this range doesn’t cover advanced players or professionals. Foosball games can get very intense, so durability is a very important concern for anyone looking to buy a foosball table. Since the Kick Venture table is usually priced for less than 400 dollars, you can’t put your hopes on it being built as strongly as a Tornado, or being overly durable, but it’s still a decent mid-range table. The Kick company offers great customer support, so its low price shouldn’t be such a red flag, and a further reassurance is that the company offers a lifetime warranty on all of its tables, and the Venture isn’t an exception. Its rods are made of semi-solid steel and mixed with wooden handles that ensure a solid grip. This adds to the table’s endurance through aggressive gameplay, however, it doesn’t necessarily ensure sustainability. Because it’s very light relative to the average foosball table, it’s not quite suited for upper-mid level players or professionals. The Kick Venture foosball table was designed in an integrated way. Its body has a fine premium wood grain finish that gives it a beautiful look and a soft, smooth texture to the touch. The ebony legs are quite sturdy and give the foosball table an air of majesty. It also has a wholesome look that grabs your attention, and the contrast of color between its body and its legs make the table’s colors pop and stand out. Its size is great for young people but also alright for adults to have a quick game or two for fun. For recreational games at home, or for making progress through practice, the Kick Venture foosball table is an excellent choice. The combination of durable wooden handles and high-quality bearings at the base of its rods helps it deliver a smooth experience for users when enjoying their game. A very nice addition to the Kick Venture table is the Skid stop Bottom which prevents the budging of the table and doesn’t make it move around as much. This is helpful because the lighter materials that the table is made from make it more prone to movement if a stronger player uses it. You might face some issues when you’re playing one-on-one because the plastic men aren’t counterbalanced, which can make it a bit hard to play a serious game due to the fact that you have to manually move the players in the front of you to prevent blocking yourself from scoring a long shot goal. It has slide scoring mounted at each end of the table to keep track of the scores instead of the players having to have a third party do it. The Front Ball Return mechanisms at either side of the table make retrieval easy and doesn’t interrupt the games often. The Kick Venture foosball table is a good purchase for someone who’s going to use it casually and for fun. It combines the affordable price and the satisfactory build quality. It doesn’t suit intermediate or professional players by any means, however.